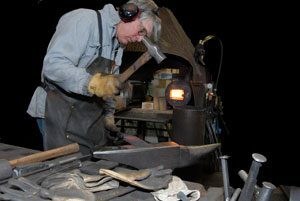 Barr has been working with tool steel since 1977 and as a professional knife maker has had the opportunity to work with some of the best bladesmiths and blacksmiths in the country. In a day and age where most tools are drop forged, stamped or cut out and then poorly tempered, a majority of people have never had the pleasure of using a well-made tool. Hand forging with hammers compresses the steel, introducing more carbon into a smaller area. Carbon is what cuts, therefore you get a superior edge. After annealing, the tools are quenched then tempered to the proper hardness. The tool is then fitted with a hardwood handle that seats properly in the socket. The shock ring on top helps prevent splitting. 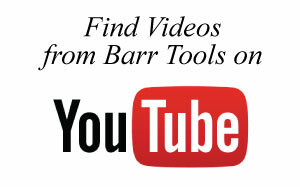 Barr’s tools all come shaving sharp and may be shipped back for re-sharpening and repair work at any time for a nominal fee. If for any reason you are dissatisfied with these tools, simply return within one year for a full refund or exchange.